(CNN) -- Former President Clinton published a list of donors to his foundation Thursday to help clear the way for his wife to become secretary of state. 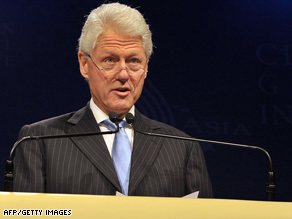 Bill Clinton speaks to at the Clinton Global Initiative conference in Hong Kong in early December. The donations to the William J. Clinton Foundation include amounts of $10 million to $25 million from the Kingdom of Saudi Arabia, the Bill and Melinda Gates Foundation and real estate mogul Stephen Bing, a personal friend of Clinton's. The Clintons came under intense pressure during Hillary Clinton's campaign for the Democratic presidential nomination to release the names of donors to both the foundation and to the Clinton presidential library in Arkansas. Bill Clinton agreed to the release the list after President-elect Barack Obama nominated Hillary Clinton to become secretary of state. The governments of Kuwait and Qatar are also on the list, as is Saudi businessman Nasser Al-Rashid, who has close ties to the Saudi royal family. Saudi Sheikh Mohammed H. Al-Amoudi, reputed to be one of the richest men in the world, is among the donors as well. Both Saudis contributed in the $1 million to $5 million range. A group called Friends of Saudi Arabia and the Dubai Foundation appear in the same category. Indian businessman Lakshmi Mittal also donated between $1 million and $5 million, as did the Elton John AIDS Foundation, the Princess Diana Memorial Fund and the Open Society Institute, which George Soros founded. Israeli-born television mogul Haim Saban, owner of the Spanish-language TV station Univision, donated between $5 million and $10 million personally or through his foundation. The two biggest donors are UNITAID, a new international organization that purchases drugs for the world's poorest people, and the Children's Investment Fund Foundation, both of which donated more than $25 million. Clinton donated between $500,000 and $1 million personally or through his family foundation, which is separate from the William J. Clinton Foundation. The foundation's projects include the Clinton Global Initiative, which seeks to combat poverty and climate change and promote health and education programs worldwide, as well as separate initiatives directed at childhood obesity, global warming, HIV/AIDS and malaria, inner city entrepreneurship and economic growth in Latin America. It also funded the construction of the Clinton Presidential Library in Arkansas. The full 2,922-page list is at www.clintonfoundation.org/contributors. It includes only donation ranges, not specific amounts, and no information about donors beyond their names.